Midwest turbines like the one pictured at left have a long history of excellent engineering, and quality components from the very beginning. The Midwest Tradition and Midwest Quiet Air turbines have the tell tale flange type bearing on front with a blue square type o-ring resting on it. Rear o-ring rests in the back cap to seat the smooth bearing on the rear of turbine. The blue square o-ring is specific to the Midwest brand and is an integral part of the turbine assembly. Other o-rings won't typically seat the turbine correctly, resulting in higher vibration and noise. If installing your own turbines, care should be taken to ensure rear bearing is seated correctly into back cap with no pinching of o-ring. Sometimes a drop of handpiece lubricant spread around this o-ring helps the rear bearing to seat correctly. The Midwest Stylus high speed handpiece has been introduced to the Midwest line and replacement turbines are now available for it as well. Replacement Midwest turbines are available for the XGT as well, but this handpiece has currently been discontinued, bowing to the more advanced Midwest Stylus in an attempt to keep up with the European onslaught of quality dental handpieces now available. Ceramic bearings are being stressed more and more in the dental industry due to their extreme hardness, perfect shape, and resistance to expansion and contraction. A well balanced turbine will last longer, and of course, cost a little more. Dealers advertising European turbine rotor assemblies and chucks for replacement Midwest turbines are typically referring to the more advanced balancing techniques, resulting in a smoother, quieter turbine. 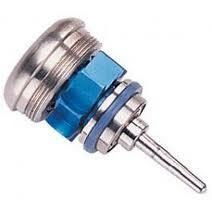 Believe it or not, you can actually balance an impeller as small as those in a dental handpiece.